Would you like to buy a bag made in the USA? Look no further. 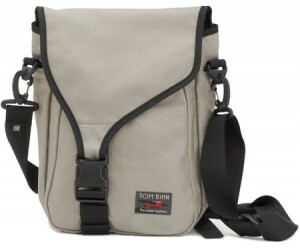 Tom Bihn has been designing and making bags for over 20 years in the Seattle, Washington area. All of the bags sold by Tom Bihn are made in their Seattle factory. These wonderful bags caught my eye on a website I was viewing and they looked so good I just had to get a closer look.Tom Bihn manufactures many different styles of bags for a large variety of computers and other devices. These include Messenger, Briefcases, Backpacks, and Travel Bags, to name a few. 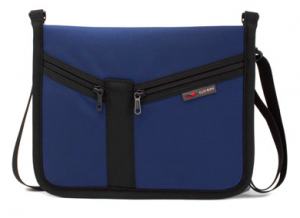 The Ristretto is an iPad/Netbook vertical messenger bag. This bag is constructed of denier Cordura nylon which is a tough textured nylon with high durability. The built-in interior padded compartment, located in the main compartment of the Ristretto, protects your iPad or Netbook from scratches and damage. The padded compartment is made with .25″ (6mm) open-cell foam laminated with durable 4 Ply Taslan on the outside, and features an interior of super-soft brushed nylon. The back side of the Ristretto is padded with 1/4″ closed cell foam. After your iPad is slipped into the inner pocket a flap along the top is folded over and closed once you secure the buckle on the outside flap. I felt that my iPad was very secure from the elements or theft. A front zippered compartment plus an open top pocket with four organizer pockets are great for pens, pencils, iPods, iPhones or anything small and loose you may want to carry. I had my iPad power block and 30 pin cable in these pockets as well as a small pad (yes, I still need paper). Speaking of paper, there is a slanted, open top pocket on the back that easily holds a magazine or rolled up newspaper. There are a variety of ways to carry the Ristretto. It comes with a shoulder strap (which can be upgraded to the “Absolute Shoulder Strap” – more on this later) and a waist strap or you can just carry the bag using the fabric loop at the top. I asked the folks at Tom Bihn if the Ristretto was waterproof, and this was their response: “The fabric is ‘waterproof’: coated with urethane inside and treated with a water-repellent outside. (You can renew the water repellent qualities with a spray-on treatment like Nikwax.) However, seams can and will leak if exposed to prolonged significant weather. Be wary of other manufacturers claiming their bags are “waterproof” just because the fabrics are coated: if the seams are not RF-welded or heat sealed, they are probably not waterproof.” Tom Bihn offers Key Straps so you can hook your car keys to the many “o” rings you will find in these bags. This bag is great to look at and very functional. The Ristretto comes in a variety of colors and is designed to carry just the essentials. It does that and more. 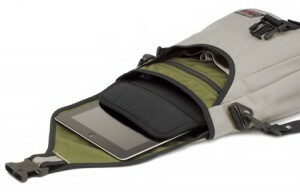 This bag was designed for the iPad and the accessories you need to carry with it. 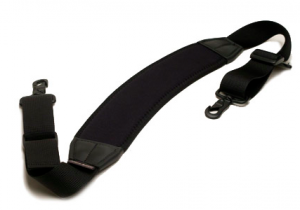 It is made from ballistic nylon with a padded open-cell foam interior. The interior is padded and soft to protect your iPad from impacts and scratches. 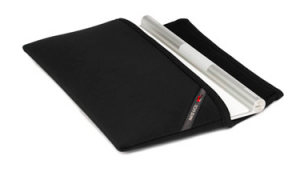 The Breve is reinforced around the binding which will protect your iPad should you drop the bag. There are two pockets on the front of the bag. The inside of these pockets are covered in soft ultra suede. One pocket is designed to hold a cell phone or iPod, while the other fits the iPad charger and ear buds. This bag comes with an adjustable shoulder strap and can be purchased in a variety of colors. You could also remove the strap and place the Breve in a briefcase or suitcase. I like the Breve. It is light and functional. One of the many things I like about Tom Bihn products is the ability to customize your purchase with all kinds of things like straps, cords, small bags, and handles to name a few. One of these items is the Horizontal Cache for Apple Wireless Keyboards. Once you slide your wireless keyboard into the cache you fold over a flap to close it. This is a handy case, but I would have preferred a zipper or velcro to keep the case closed. The standard Tom Bihn shoulder straps are fine, but $30 will get you the Absolute Shoulder Strap, a soft, durable neoprene pad with comfortable stretch backing. I have to admit this is one of the best shoulder straps I’ve ever used. It is very comfortable, especially with heavy bags. 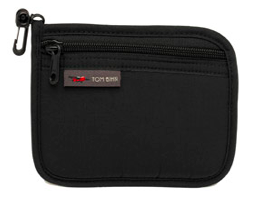 Another accessory is the Padded Organizer Pouches. These zippered, padded pouches come in a variety of sizes and colors, and can be clipped to the “O” rings inside the various bags. Very handy. The last “accessory” I want to talk about today is the Ultrasuede Screen Cloth ($7). This soft cloth has no stitching so there is nothing that can scratch your device. These are great and easily clean fingerprints off your iPad/iPhone/iPod screen. They are washable and come in a variety of colors. All of these bags are multi-dimensional in that you can purchase accessories to make them even more useful, customizing them for what you need. I am quite impressed with the quality and variety of items Tom Bihn offers. If you live in the Seattle area Tom Bihn has a showroom/store with limited hours that you can visit. Quality, variety, visually appealing, and made in the USA. What more could you ask for?